A prison service officer became the latest victim of the violence that has rocked Mombasa town. The officer was killed when a group of youths protesting the killing of Sheik Aboud Rogo Mohammed hurled a grenade at the truck that was carrying the officers. Thirteen other prison warders were rushed to hospital with serious injuries. The prison warders had moved in to compliment the regular and general service police officers to restore order in Kisauni area after violence erupted again Tuesday morning following rumors that the wife of the slain radical preacher had died in hospital. The rumour was however dispelled by a family member who confirmed that the wife was recovering well in hospital. Earlier Tuesday morning, the youth set the Presbyterian Church of East Africa (PCEA) Kisauni on fire and property of unknown value stolen from the church ministerâ€™s house. Since Monday afternoon when the chaos started two churches have been set on fire and three others vandalized raising concerns that the violence could be taking a sectarian angle. Youths barricaded several streets with burning tyres in the Majengo, Buxton, Tudor and Kisauni areas before armed police dispersed them. Some of the demonstrators called for holy war against the authorities, claiming that Sheikh Aboud Rogo Mohammed was a martyr killed in jihad. The fierce cleric, who was shot dead on Monday by unknown assailants, was on US and UN sanctions lists for allegedly supporting the Al-Qaeda-linked Al-Shabab terror group, through fundraising and recruiting non Somali youths to join Alshabaab. Police have been engaged with the demonstrators since Monday afternoon and have been forced to fire rubber bullets and teargas to disperse marauding demonstrators. More than twelve protesters have been arrested so far mainly in Majengo and Msikiti Musa areas. Authorities have appealed to the public for information on Rogo’s killing. 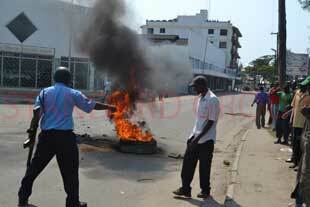 Many Muslims in Mombasa blamed the killing on the police, who have denied any involvement. Meanwhile, the Somalia terrorist group Al-Shabaab called on Kenyan Muslims to “take all necessary measures” to protect their religion. “Muslims must take the matter into their own hands, stand united against the kuffar (unbelievers) and take all necessary measures to protect their religion, their honour, their property and their lives from the enemies of Islam,” the Al Shabaab terror group said in a statement. So far no arrest has been made in relation to the killing of the radical cleric; the goverment through the office of Director of Public Prosecutions (DPP) has set up a high level team to investigate the killing of the slain Cleric. Assistant deputy DPP Jacob Ondari will coordinate the team that includes representatives from the Independent Police Oversight Authority, the Kenya National Commission on Human Rights, the Law Society of Kenya, the Commission on Administration of Justice and the police. Leaders across the political divide have called for calm as tension remains high in the area. They included Prime Minister Hon. Dr. Raila Odinga, Deputy Prime Ministers Musalia Mudavadi and Uhuru Kenyatta, Mvita MP Najib Balala among others. In Parliament, MPs demanded that details of the killing of Sheikh Rogo be revealed to the public. The MPs also demanded to know why no arrest has been made yet the killing of Sheik Rogo occurred near a police station and a tourist circuit with high security presence. The violence may escalate if the government and local Muslim leaders do not act swiftly, there are long standing grievances; land ownership and public resource sharing, and high poverty and unemployment levels may fuel the chaos further. Although the Mombasa Republican Council, a secessionist group has denied involvement in the unrest, much of their grievances can easily be picked up by opportunistsâ€™ to continue with the violence. The continued violence may hurt tourism in the region and slow down the already lagging economy. The govt is lagging back in taking action on serious matters especially those of security. Why should the life of many be at risk just because a small insecurity scenario cannot be secure with the many armed forces Kenya has?